I keep a little box of products that I have, personally, been disappointed with and once I get to about five things in the box I do a little blog post about why I find them so disappointing. I know some of these are a bit controversial but hey, you can't win them all! This is probably the only Caroline Hirons raved about product I haven't loved. I sourced this moisturiser from the States after reading Caroline speak highly of it but unfortunately it just broke me out constantly and I ended up giving it to my mum. Literally as soon as I stopped using it my cystic type spots around my chin healed and went away. The moisturiser contains lactic acid to maintain skins PH levels (and also act as an exfoliant) and jojoba and avocado to hydrate and smooth. It also contains soothing aloe and natural antioxidants from grape seed. Looking at the ingredients list I can't see anything that I know would irritate my skin but sadly it did. I did like the hygienic pump applicator (although you have no idea when the product is going to run out) but I think that the formula was just too heavy for my combination skin. This is definitely a controversial one as I have seen people literally label this as holy grail stuff but for me it just has no coverage or lasting power at all. Admittedly I like a fuller matter coverage but I was dying to try this foundation after reading so many good reviews. I really did my research and concluded that Lasting Silk was the way to go as it seemed to be the formula offering more coverage over Luminous Silk. I tried this over a week and first of all it applies horribly with my usual foundation brush (Real Techniques expert face brush). I couldn't build up any coverage at all and it was constantly streaky and patchy when applied with the brush over my usual primer. And then, by lunchtime it had completely disappeared and I didn't feel like I had any foundation on my face at all. A definite miss for me. My best friend loves these but I hate them. I don't find them to be very hydrating at all and it makes my lips tingle when I apply it. I also don't like the shape of the balm and would only apply it in private as I don't like to look like I am kissing my lip balm! Again, I know these are well loved by beauty bloggers but they're not for me. I know I know, another much hyped product but honestly I just don't get it. My main issue? The applicator is just disgusting-it's a foam applicator that is perforated to push the product through when you squeeze the tube but it's really unhygienic and I have read reports of them going mouldy (yikes). I find when I use it I suddenly seem to have dry and flaky patches I didn't even know I had and there is an ingredient that seems to irritate my lips and dry them out further. This is a non sticky gloss/balm with a subtle, plumped up shine to the lips and although I was happy to try out this trial size version, I am glad I didn't give into the hype and purchase a full size one. In general I am a huge fan of the Sephora PRO range and if anyone ever asks me for advice on what to buy from Sephora I always recommend this range of brushes because in the main they are awesome. I bought this brush blind from the US website, thinking it would about the same size as my Real Techniques stippling brush and would be great for applying cream blush. As you can see from the photo below it's literally mahoosive when compared to the RT version. And here lies the problem with this brush-I am not sure what to use it for. It's huge but not dense enough to apply foundation with-the finish is really streaky. It's a bit too dense for powder and unless I had cheeks the size of saucers I can't use it for blush. It doesn't clean well either, I have washed and washed this brush but it doesn't seem to come clean at all. It also shed terribly the first time I used it and is very 'top heavy' meaning that you need to hold it very near the base otherwise it's difficult to control. 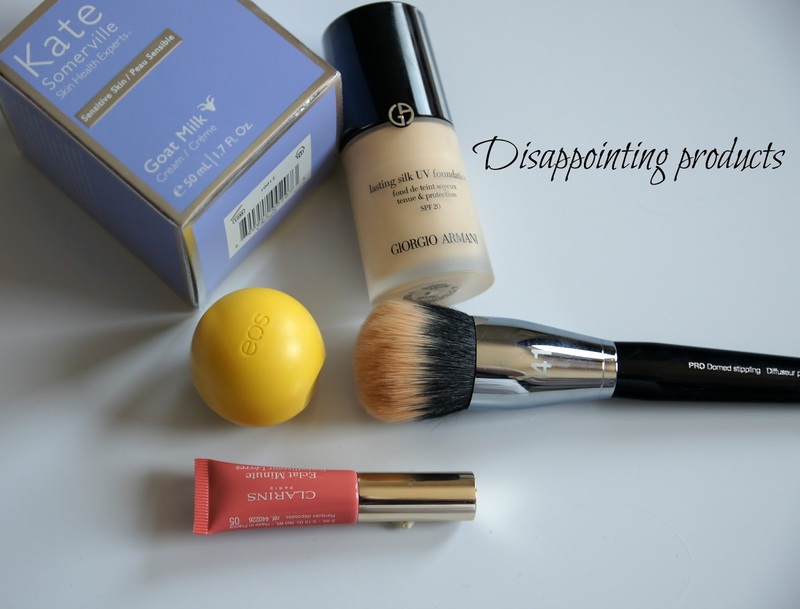 Have any beauty products disappointed you recently?